You’ll be submitting final grades for SP18 soon. If you need a reminder of how to submit final grades, or a step-by-step tutorial, we’ve provided some resources you might find helpful below. Please contact the CON IT instructional design team if you need additional assistance. Need to change a grade you’ve already posted to Faculty Center? See the Registrar’s instructions to change a grade online. Download the related Carmen Final Grades Cheatsheet for AU17. If you’re using old Carmen (D2L) this autumn semester, you can use this step-by-step guide to submit your final grades. If you’re using new Carmen (Canvas) this semester, you’ll submit grades by clicking on the little red gear icon to the right of your course title on the Canvas landing page. First, make sure you are using the right grading scheme for final grades. When you’ve done that, you can follow these steps (click on the Details tab) to submit final grades. Questions or problems with grade submission? Contact us at CON-InformationTechnology@osu.edu. Are you ready to launch your Canvas course for the autumn 16 semester? Here are a few tips that can get you started on the right foot. You need to publish your course so your students can view it. The Publish button is on your course home page. Read more about how to publish your course. 2. Make sure your Module items are published as appropriate. Gray items with a gray cloud (and an X in the cloud) are unpublished. Green items with a green cloud (and a checkmark in the cloud) are published. If a module is unpublished, everything in that module is unpublished, even if individual items appear published. In other words, the unpublished status of a module overrides the status of the published item within it. Read more about publishing modules and items within modules. Items in red boxes are unpublished. Items in green boxes are published. 3. View your course from the student point of view and go through each item to make sure it appears the way you intend for it to appear. Check your links, even if (especially if) you imported them from your old Carmen course, to make sure they work. It is particularly important to make sure your Panopto and CarmenConnect synchronous session links work and they all lead to the appropriate site. 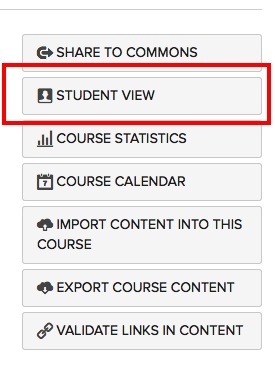 Click on Settings > Student View to see your course as a student would. Read more about the Student View in Canvas. 4. If you need to add users to your course, you can do so from the Canvas landing page. work through the prompts to add and enroll the user and confirm. Read more about adding users to your Canvas course. Electronic grade change is back! Instructions to change a grade are available on the Registrar’s website also. Go into Carmen and enter the destination course. Under Copy Components from another Org Unit, click Search for offering. Type in the course number (or leave blank to see all courses) and click on the magnifying glass. Check the button next to the course and click on Add Selected. Click on Copy All Components (to copy everything) or choose Select Components to pick and choose what to copy. Generally, copying all components is a good choice for moving from one semester to the next. Wait while the course components copy. Click on View Content or any other link in the navbar to see what’s been copied over. The course name and number in parentheses as it appears in Carmen that you are copying into (the new course). The course name and number in parentheses as it appears in Carmen that are copying from (the old course). A screenshot of the error or the text of the error message you received. Errors in course copying are sometimes caused by blank content modules or submodules in the old course from which you are copying, or they can be caused by content files that are “broken.” Look for red exclamation marks in your Carmen Content items in the old course. 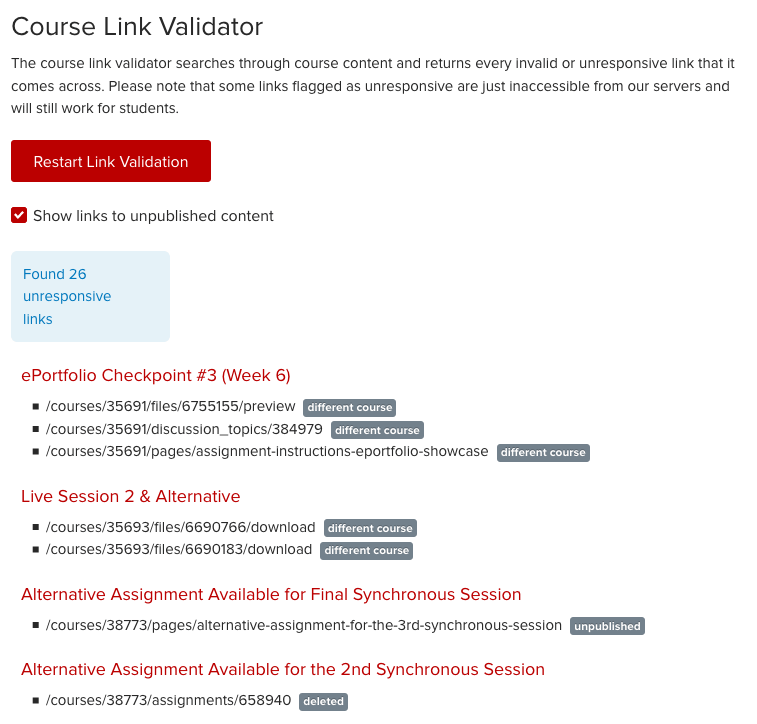 Removing those items may resolve the error encountered during the course copy process.